If you like my blog on facebook, follow me on twitter or if you’ve noticed the Foodista widget in my far right sidebar, you might know that one of my recipes was chosen to appear in the brand new Foodista Best of Food Blogs Cookbook. The book, released on October 19th, 2010, is an international effort featuring 100 terrific recipes from 100 food bloggers. It’s gorgeous and I’m pretty excited to be in it: this is the first recipe of mine to officially appear in print. 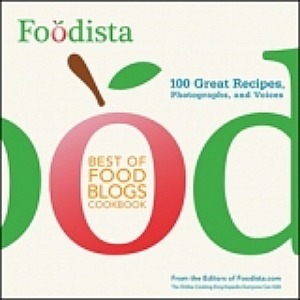 To celebrate the release of the book, Foodista is featuring a prize giveaway for those who purchase the book on November 3, 2010 from 10 a.m. to 11 a.m. P.D.T. For details, please see this post. There are definitely some great prizes being offered, so if you’re thinking about buying the book, entering the giveaway by doing so during that hour is a good plan. **Note that I’d love it if the book does well, but I’m not benefiting financially from it’s sale. That’s really exciting, congrats! I love your blog and I’m happy you are being published. Congratulations! That must be such a thrill.